Effortlessness is captured in this chic kimono. The burnout floral fabric and the flattering (and forgiving) silhouette is ripe and ready for endless wear. I purchased this kimono prior to the holidays. I wore it at a Christmas partyand also at Wolfgang Puck's Spago restaurant. I love this topper and it is so comfortable. I received manycompliments. 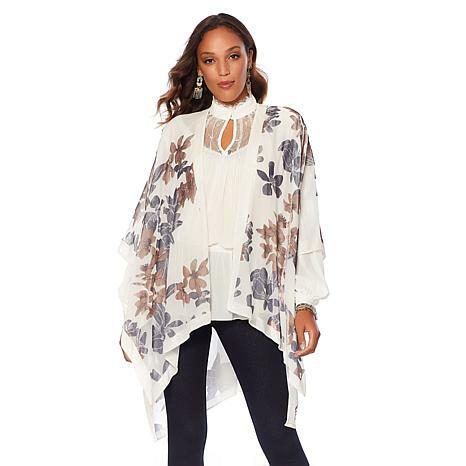 Ordered this kimono in the ivory & its gorgeous! It goes with so many items in my wardrobe, & works to tie separates together to make really chic outfits. Im petite, 5 2, size 6, & I like the length. Looks great w my faux leather leggings & new long, faux suede LaBellum skirt, or w pencil skirts. Im wearing it w booties now, but high boots soon when it cools off. It goes with browns, ivory/winter wht, black & grays. Just went back & purchased the black kimono. Loving its flexibility! I bought in black. Colors brighter on back than the front. Wasn't quite what I wanted but still lovely. I order this in the Ivory...fits perfectly, Im a size M, so afraid to would be too big. I have other Lady Antebellum pieces and love them all. Im 54 so the length and flow is perfect. Slinky Brand 3/4-Sleeve Hanky-Hem Open-Front Jacket Layer your look for added dimension. This hanky-hem drape-front jacket works wells over a classic tee when paired with your favorite jeans. 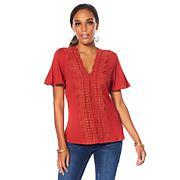 Pull it on for an easy wardrobe update that leaves you fabulous and fashionable.